A photo posted on Mama’s Milkies Facebook page and then later on Breastfeeding Mama Talk Facebook Group earlier in July attracted a lot of attention from followers. 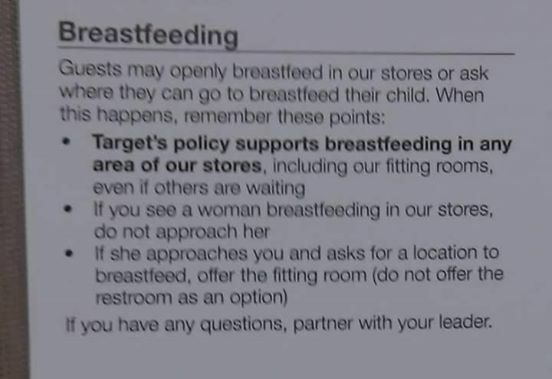 The photo was a hazy picture someone had taken Target’s policy when it comes to mothers breastfeeding in their store reported TODAY. This is a very positive turnaround for Target which had to deal with a “nurse-in” in 2011. The nurse-in consisted of nursing moms going into hundreds of Target stores and nursing their babies in public. It occurred after a Texas mother was harassed numerous times by Target employees when she quietly sat in the corner of a target store, covered up, and nursed her baby.